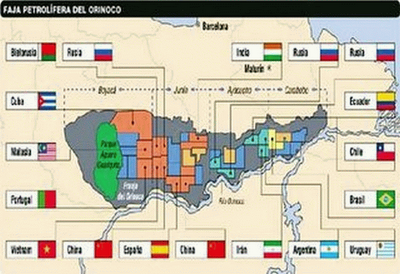 Juan Cristóbal says: – File this under “important stories we are not paying enough attention to:” the government’s efforts aimed at finding partners to develop the Carabobo Block in the Orinoco heavy-oil producing region are hitting some serious roadblocks. As you may recall, a few years ago the government changed the entire legal framework under which the oil industry operated. It nationalized – took over, some would say – several foreign oil companies and demanded that, in any future projects, foreign investors had to be minority shareholders. Much revolutionary pomp ensued, and much-needed foreign investment quickly dried up. Carabobo, with the potential to produce 400,000 barrels per day, is the first real post-nationalization investment opportunity the government has opened up to bidders. PDVSA is in desperate need of capital and technology. Carabobo seems the perfect bait to lure both into the country. In spite of its importance, it’s not working. We hear reports that the criteria to select the winning bids is changing. One of the points of contention was that the oil companies were not pleased with PDVSA’s demands that any winner provide it with an up-front cash bonus of between $500 million and $1 billion. The amount was considered too high even for the oil industry, more so in a scenario of weak oil prices. Another point of contention is arbitration. Most foreign investment contracts include clauses for deciding conflict through arbitration. PDVSA is adamant that Venezuela is “sovereign” and will not submit itself to freign arbiters. Yet in a sign that it is loosening up its criteria, we hear they have partially reneged and are willing to allow arbitration for the financing portion of the contract – not the investment portion. How they plan to differentiate financing funds from investment funds is not clear at this point. Obviously, the State’s rapaciously high tax structure, as well Carabobo’s costs of production of up to $20 per barril, are making oil companies think twice. If the price of oil were at its 2008 levels, this would be a no-brainer, but in the context of low prices of oil and scarce international credit, some people are expressing doubt. The Ministry, in a sign of a weakening bargaining position, has even agreed to revise its tax structure in order to lure better offers. How will this play out? We’ll soon find out. The opening of the envelopes is scheduled for July 28th. Post 21 of 100 … good night everyone.